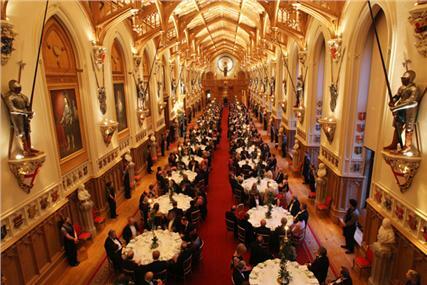 2011 is the Centenary year for the Chartered Institute of Marketing (CIM) and on Monday this week they held a Centenary Banquet at Windsor Castle with HRH Prince Philip (Patron of the Institute) in attendance. I was really lucky to receive an invitation so decided I really should attend - it might well be the only time I get an invite to eat there! It was a great evening, really good food, the service provided was excellent - as was the wine, and it took place in a fantastic place to celebrate - the banqueting hall is very impressive. Many thanks to all those involved in the organisation, it was a great event and I felt honoured to be able to be there. You can (just) see me in the above photo - I know where I was sitting which helps! !